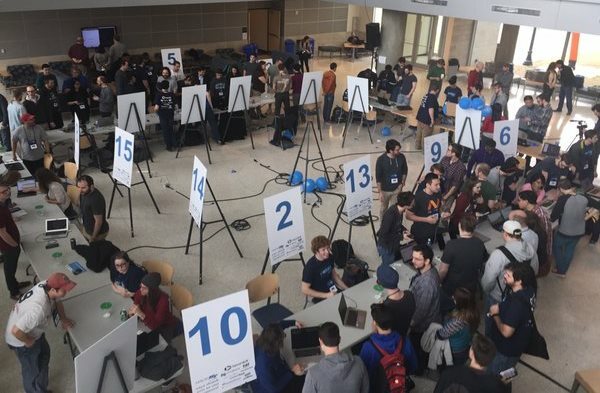 Students from Belmont’s Mathematics and Computer Science Department recently participated in Hack-MT including Corey Sery, John Ottenlips, Jonathan Lane, Sara Chung, James Dickenson, Phil Knock, Adriano Balini and Austin Ban at MTSU. Recent Belmont graduates Geoff Gross, Kevin Huber, and Bob Rochford also participated taking mentorship/leadership roles throughout the weekend. The event gathers software developers, visual designers, programmers and computer science students from local universities and form teams to invent new web platforms, mobile apps and electronic gadgets. The students spent 42 high-intensity, uninterrupted hours (from Friday at 6 p.m. to Sunday at noon) developing mobile and/or web apps, video games and other tech related projects. 200 people participated in the event and 70 percent of participants were from MTSU, Belmont, Lipscomb, Vanderbilt, UT Knoxville and Fisk. The remaining participants were industry professionals. 16 products were developed by teams throughout the weekend. Hack MT is a first-time event led by MTSU, Hack Tennessee and the Tennessee STEM Innovation Network. The leadership team included Dr. Glenn Acree, professor of mathematics who represented the Tennessee STEM Innovation Network, Dr. Chrisila Pettey, Dr. Bud Fischer, Nicole Chitty and Brian Holley from MTSU and Brendan Wovchko from HACK Tennessee. Click here for coverage of the event by NewsChannel5.